Our red aged santa cap and mittens are a must have for the holidays. 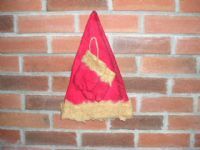 13"
Our red aged flannel santa suit is perfect for hanging on a wreath, door or mantel. 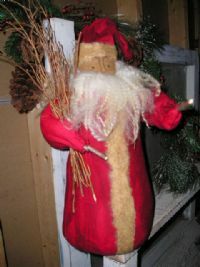 19"
This santa is an old time favorite. Very simple with his aged red flannel and sweet huck stems in arm. Beautiful lambs wool beard. 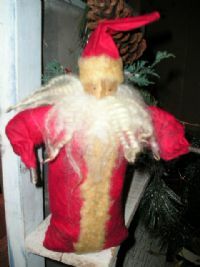 Stands 15"
Here is our 10 1/2" standing red flannel santa with a sack on his back. Sack is filled with greens and a sprig of red berries. Beautiful sheeps wool beard. 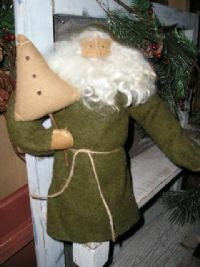 Very popular is our standing santa dressed in our green army wool and hood, he is holding a tree in one arm. 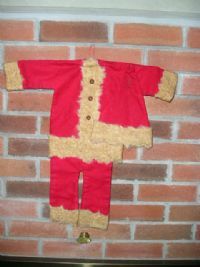 As with all of our santas a beautiful sheeps wool is used for the beard.